Get all the tools you need to create the perfect pharmacy technician resume with our FREE downloadable sample, matching cover letter, and expert writing tips. 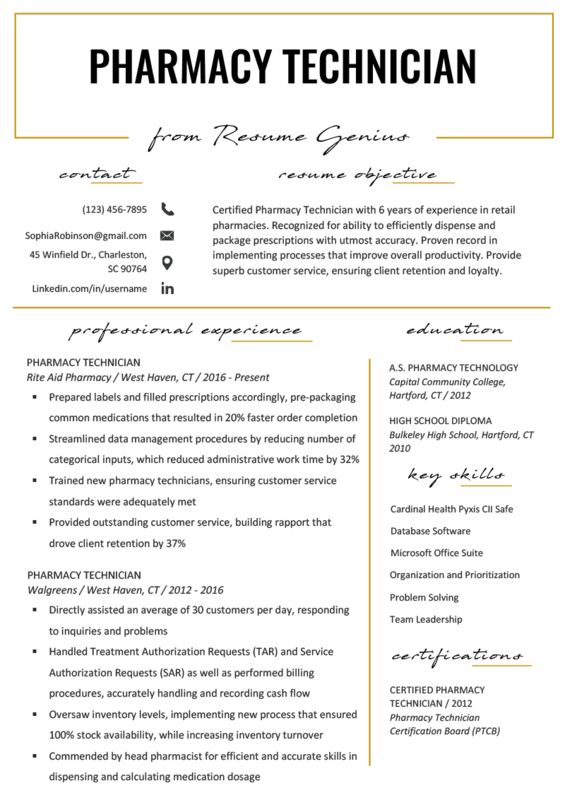 Certified Pharmacy Technician with 7 years of experience in retail pharmacies. Recognized for ability to efficiently dispense and package prescriptions with utmost accuracy. Proven record in implementing processes that improve overall productivity. Provide superb customer service, ensuring client retention and loyalty. A technician searches for medication. First and foremost: if you have earned a Pharmacy Technician Certification, displaying this information near the top of your resume is the fastest way to get the hiring manager’s interest. In some states, it is mandatory to have a certification. However, if you live in a state where it isn’t mandatory, earning one is a surefire way to increase both your hourly wage and your chances of landing a job. You can click this link to visit the Pharmacy Technician Certification Board website and apply for the exam. Attention to Detail & Organization: You will be counting pills and packaging medications, and a mistake could mean causing a life-or-death situation. Emphasize your exactness, preciseness, and relentless attention to detail. Friendly Customer Service: As the technician, you are also the face of the pharmacy. Your customer service will make positive or negative impressions that will impact where customers choose to purchase their medications. Emphasize your friendly personality and ability to reach new customer service goals and increase customer retention. Knowledge of Insurance & Billing Procedures: Highlighting your knowledge of complex insurance paperwork and billing procedures will make you a valuable candidate, because it indicates you will require little training. 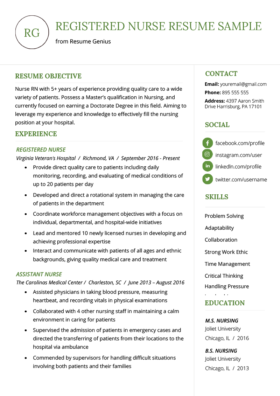 The Pharmacist Technician in the sample resume above begins with a Career Objective. This section is designed to give the hiring manager all of the information they need to determine if your resume is a keeper, or destined for the trash can. Remember the three main skills we suggested emphasizing earlier? This Career Objective covers all of them — efficiency, accuracy, and customer service. “7 years of experience” is just the cherry on top. In the Career Objective, you will make grand claims about your abilities and expertise. Your Professional Experience section is where you back up those claims with hard evidence. The key to writing a powerful Professional Experience section is using numbers to bring your abilities and skills to life for the hiring manager. A dull list of job duties may get you an interview, but you won’t be viewed as an excellent potential candidate, and that will influence the interviewer’s attitude towards you. This bullet point emphasizes how the candidate was able to increase efficiency in their previous workplace by making common-sense reforms. The bullet point reveals that the candidate is not only intelligent, but also hardworking. Organizing medication is a key aspect of the technician’s job. Pharmacy Technicians do a heavy amount of administrative work, having to deal with insurance and billing procedures. This candidate shows that he knows the root cause of data management inefficiencies, and also understands how to innovate effective solutions. 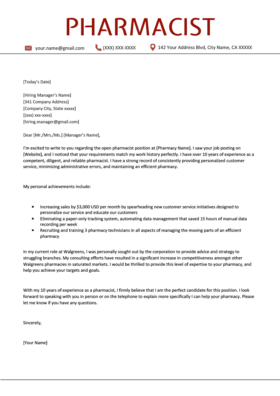 Where other candidates may simply claim that they are friendly and excellent at customer care, this candidate is able to provide hard evidence that he truly possesses these valuable Pharmacy Technician traits. Any hiring manager in this industry would be very impressed by this bullet point. You will need to think about how to emphasize your own achievements on your resume. Action verbs make your resume “punchier” and therefore easier and more satisfying to read. Here are a list of common action verbs used on Pharmacy Technician resumes — but if you need more, we have the longest action verb list in history to help you make a better selection. You may have expertise in different software — include it on your resume. That concludes our how-to guide. 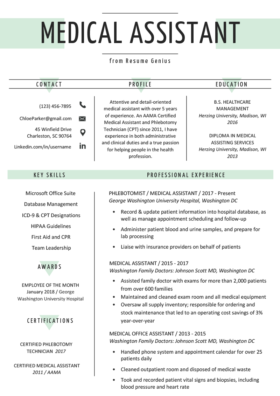 If it seems difficult, our world renowned resume builder can help you create a Pharmacist Technician resume in minutes. We provide HR-approved templates, bullet points, and helpful suggestions along the way.